Collins Booksellers - Advances in Safety Management and Human Factors by Pedro Arezes, 9783319419299. Buy this book online. This book discusses the latest findings towards ensuring people’s safety, health, and welfare at work. It crosses different disciplines, such as work physiology, health informatics, workplace design, injury prevention, and occupational psychology. It presents new strategies for safety management, including accident prevention methods, such as performance testing and participatory ergonomics. 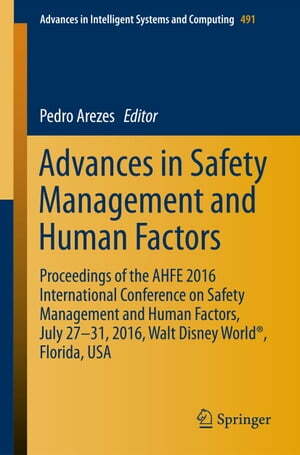 The book, which is based on the AHFE 2016 International Conference on Safety Management and Human Factors, held on July 27-31, 2016, in Walt Disney World®, Florida, USA, provides readers, including decision makers in government and public authorities, with a timely snapshot of the state of the art in the field of safety, health and welfare management. It also addresses agencies such as OSHA and NIOSH as well as other professionals dealing with occupational safety and health.